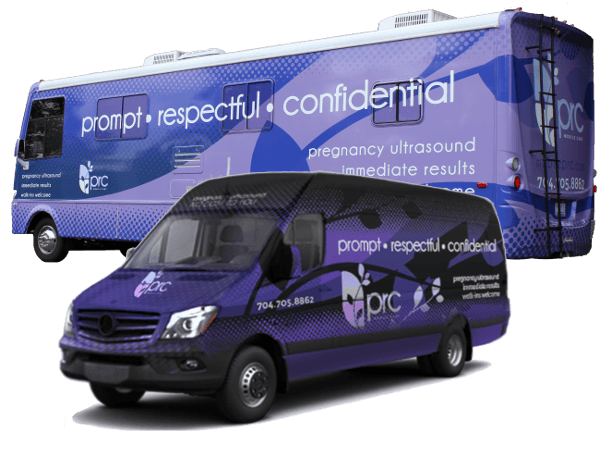 Pregnancy Resource Center of Charlotte operates PRC Mobile Care units to help verify early signs of pregnancy in neighborhoods near you! If you are planning on visiting an abortion clinics in Charlotte NC the state requires a pregnancy ultrasound to determine if the pregnancy is viable, the number of weeks pregnant you are, and which abortion procedure is available to you. We have no financial interest in your pregnancy - 100% of our services are free of charge. The Mobile Care Units travel the Charlotte metro area staffed with medical teams prepared to provide pregnancy tests and pregnancy ultrasounds in a convenient location near you. If you are experiencing early signs of pregnancy and think you might be pregnant we are here for you. Schedule an appointment at our Uptown Center location near CPCC or click the green bottom below to determine the best location to visit one of our PRC Mobile Care units. Walk-ups are always welcome but we encourage you to set an appointment to minimize your wait time. Where is the Mobile Care Unit Today? If you are experiencing early signs of pregnancy and live in the following areas of Mecklenburg County our mobile units can get to you: Arboretum, Ashley Park, Ayrsley, Ballantyne, Belmont, Blakeney, Charlotte Center City, Chantilly, Clanton Park, Cotswold, Coulwood, Derita, Dilworth, Easthaven, Elizabeth, Enderly Park, Hickory Grove, Hidden Valley, Highland Creek, Historic South End, Grier Heights, Johnson C. Smith University, Nations Ford, NoDa, Northlake, Plaza-Midwood, Shamrock, Shopton, SouthPark, Steele Creek, UNCC, University City, Uptown Charlotte. If you do not see our pregnancy care center units scheduled in your neighborhood this week, call us for an appointment. There is never a cost to you for our medical services.